Fall is the time to plant garlic in your garden. Here in Zone 7 I plant garlic sometime during the last two weeks of October. I like to have my cover crops and garlic in by November 1. According to Pam Dawling in Sustainable Market Farming, a guideline for planting garlic is when the soil temperature is 50° F (10° C) at four inches deep at 9am. She plants it in early November and, if anything, where she lives is a slight bit cooler than where I am. So, there is no real rush to get it in the ground but, in areas with cold winters, according to Dawling, you would want to have it in the ground no later than 2-3 weeks after the first fall frost and before the ground freezes for the winter. Here in Virginia the ground fluctuates between freezing and thawing throughout the winter. Garlic sprouts in my garden in the fall and the tops will grow whenever the temperature is above 40°F (4.5°C). In colder areas the tops might not emerge until late winter, but the roots will be established from the fall planting. Mulch with leaves when you plant and you will have little tending to do until harvest. The garlic will grow right up through the mulch. If you don’t mulch, you will need to keep the bed weeded. What you will be planting are the individual cloves. When you buy garlic you are buying it as bulbs. Softneck garlic, the kind you see in the grocery store, has about 10-12 cloves per bulb. The cloves in the middle of the bulb are smaller than the outside ones. Hardneck garlic has fewer (6-7), but larger cloves. 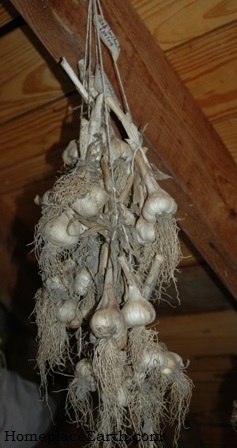 Compared to the hardneck varieties, softneck garlic keeps in storage longer and is easier to braid. Each clove that you plant will grow into a bulb. If you are excited about your garlic in the spring and pull some up in early April to see how it is doing, it is important to know that the plants don’t divide into cloves to form the bulb until about 30 days before harvest. In early April you will only find one large clove. Garlic harvest here is in early June. 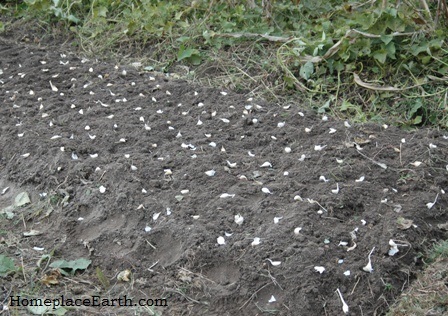 Garlic cloves set out on 6″ centers ready for planting. According to the Master Charts in How to Grow More Vegetables, garlic cloves should be planted 4” apart in an hexagonal pattern in the bed. I think that is a little close and prefer 6” spacing using that pattern. Years ago I planted a whole bed at 4” centers and made careful notes. I found that the garlic on the outside edge of the bed was larger than the harvest from the middle; with that on the south side larger than the bulbs on the north side. 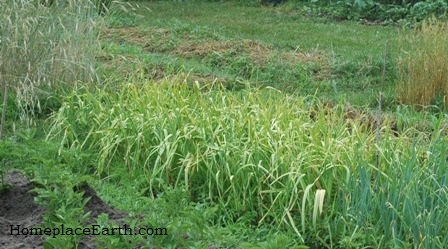 The garlic harvested from the inside of the bed was smaller planted at 4” centers. That might be so to some extent with the 6” centers, also, but not as much as when planted at 4”. Plant about 2” deep—a little deeper in the north. When I harvest garlic I find myself thinking that maybe I will plant garlic only in the perimeter of a bed in the fall, leaving the middle for a spring crop, such as cabbage or potatoes that would be harvested with the garlic in June and see if all my harvest is the largest bulbs. But then I get busy and forget and plant garlic as usual, filling the bed in the fall. Dawling plants in rows with 5” spacing within the rows and 8-10” between the rows. I could go on, but you get the idea. You need to be eating garlic. Years ago when I was selling produce at the Ashland Farmers Market I met Mrs. Virginia Shelton when she was in her 90’s. She was still driving her car and she told me she was on no medication except for the J.C. pill—just ask her pastor she said. Besides her participation in church, she credited her longevity and health to eating garlic every day. Well, no one lives forever and Mrs. Shelton is no exception. She passed last year, one week shy of her 109th birthday. She gave up driving at 99, but still lived independently until eight months before her passing. I feel fortunate to have met Mrs. Shelton and for her to tell me about her garlic consumption. Once you harvest garlic you can save a portion to plant for the next fall. If you haven’t planted it before, you will need to get it somewhere. Southern Exposure Seed Exchange is a good source although, depending on where you live, you might find a source a little closer to home. I suppose if time is running out and you haven’t ordered any, you could always plant what you can get at the grocery store and see what happens. Life is an adventure, you know. Happy planting! I hope you have been making notes from your garden and your kitchen about what you have been growing and eating this summer. Being able to eat as much of a meal as you can from what you have produced is a feeling of accomplishment. Even if you don’t grow everything you eat, supplementing your meals with items from local growers can give you the same good feeling. It is very satisfying to sit down to a meal and know where everything came from and how it was grown. If you are striving to produce meals with only (or mostly) homegrown ingredients, what would you have to provide, in addition to what you already grow, to make that happen? For example, you could make sure the ingredients for salsa or spaghetti sauce are in your garden plan. In my Homegrown Friday posts you can read how I only consumed what I’d grown for the Fridays in Lent. If you run out of ingredients in your favorite dishes long before next year’s crop comes in, plan now to plant more if space allows. I know that garden space is at a premium for many and that careful choices need to be made. In that case, think of local growers as an extension of your garden. Whatever they can supply in abundance is something you can take off the list for your garden if you have limited room. You could devote your garden space to the things you love that there is never enough of at the local markets, whether it is sugar snap peas, potatoes, or a special winter squash. Maybe you want to eat from your garden all winter. Those crops need to be planned for, since they will be planted while the traditional summer crops are still in the ground. 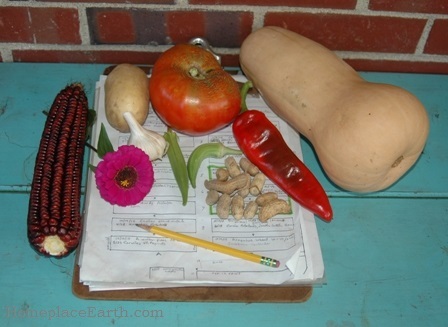 You will find a three-bed plan for winter eating in my post Winter Food Crop Rotation. 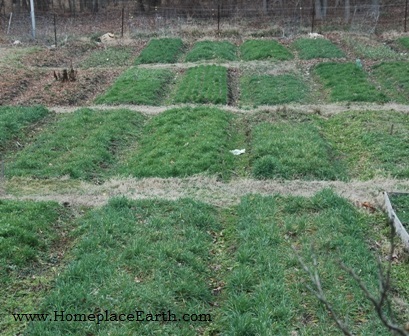 Cover crops in late winter. Now is the time to be planning for next year because as the summer crops fade away and space opens up, cover crops need to be planted. Which cover crop to plant in each bed is determined by what crop will follow next year. If you are managing cover crops with hand tools, as I advocate, the cover crops have to be finished before the next crop goes in. By finished I mean winterkilled, cut at the proper time to lie down as mulch or compost material, or harvested at the end of its life cycle. A handout that will help you with cover crop decisions is available as a free download on the resource page on my website. In Grow a Sustainable Diet there are sample garden maps showing how to include cover crops in your rotations, the reasoning behind the cover crop choices, and thoughts on what other choices could be made. Getting cover crops planted this fall is your first step to having a great garden in 2016, as long as they are planned with the next crop in mind. 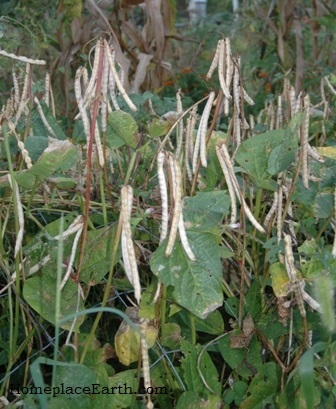 Mississippi Silver cowpeas ready to harvest for dry beans. Just so you know, the perfect garden plan doesn’t exist. You will always be changing it as new ideas come your way. 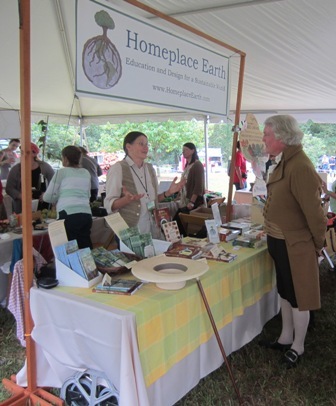 Also, the weather has a way of encouraging gardeners like us to look at new varieties and new crops to add to our plans. Cowpeas came to be part of my garden after a couple years of serious drought. I put my mind to what grows well in dry times here in the mid-Atlantic region and came up with cowpeas, sometimes known as Southern peas. That first year with the cowpeas was another dry one and they did great. Don’t you know, the following year was the wettest year I have ever experienced. The cowpeas did great then, also, and have been part of my garden ever since. I save seed each year, ensuring I will have adequate seed for next year that is already acclimated to my garden, no matter what the weather brings. If eating a substantial part of your diet from your garden and local sources is a goal for you, participating in the 10-Day Local Food Challenge can be a gauge to measure how far you have come. The formal challenge is taking place October 1-10, but you could determine any days to be your challenge. The formal challenge suggests you eat food grown within 100 miles for 10 days. Acknowledging that humans have been trading for eons, 10 exotics are allowed to augment your local/homegrown diet. The exotics are things not grown within the 100 mile limit. So, if you really can’t exist without coffee and chocolate you can include them in your exotics while you think about weaning yourself off of them a bit. Maybe you could experiment with herb teas from your garden rather than having another cup of coffee. I don’t have any suggestions for the chocolate other than to experience all the flavors you can from your garden, which will fill your belly and your soul, lessening the need for something like chocolate.